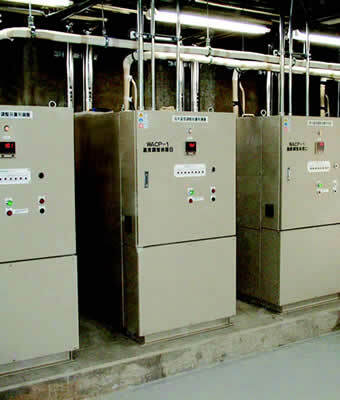 ● It is possible to control water temperature with high accuracy from low to high water temperature by our temperature control technology which is cultivated in environmental control field. ● It is a unitized compactly, and it is needed less installation space. ● Depending on amount of water treatment capacity, we can offer various types of systems from small to large capacity. ● It is also preparable an aquaculture system which is combined with water tank and filtration. ※ The above is an example. Please contact us for more information.